Cars are essential to get from point A to point B. Are you in the market for one? You’re in luck! Whether you’re looking to finance a used car or a new one, either way you’ll have reliable transportation that will make your life a lot easier. Plus, whatever type of credit you have, there’s a good chance that you can qualify for a car loan with LendingArch. Of course, deciding to buy a car is one of the easiest steps in the car buying process. That’s why our team is here to help. In this post, we’ll first address the question: can I get a car loan for a used car? Then we’ll dive into other key questions and information about used cars vs. new. Let’s get the first question out of the way. Can you really get a car loan to buy a used car? Simply put, yes. While there are both pros and cons to car loan (more on that later), it is possible to obtain an affordable car loan on a used car. What are some of the key differences seen in a used car loan? Oftentimes lenders won’t give loans to cars that are more than 4-5 years old since older cars can either develop big mechanical issues or have extensive mileage. The interest rate on a used car loan will be at least 2% higher than if you’re financing a new car. One of the main factors behind this is the resale value. 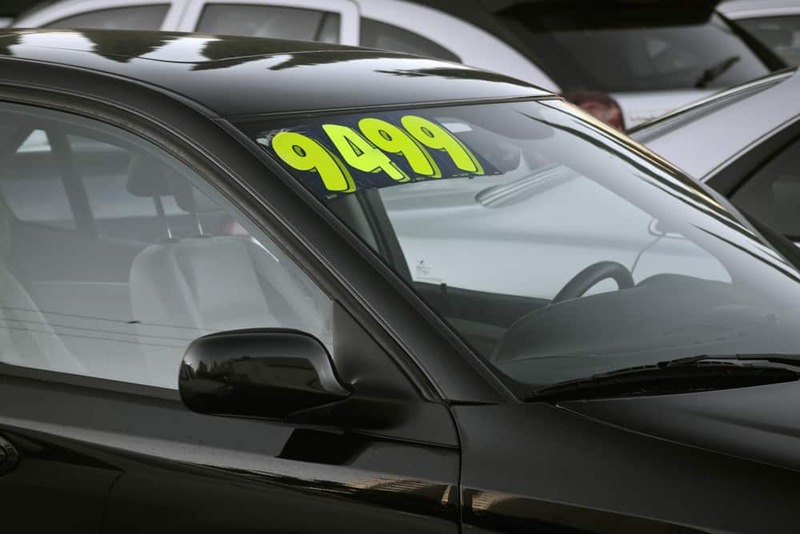 It will be extremely hard to calculate the value of a used vehicle when you go to sell it. Privately owned used cars are handled differently than ones at a used car dealer (or even those at a regular dealership), simply due to taxes and reputation associated with each. Where you buy a used car can potentially affect the loan amount and terms. A great way to get a deal on a car is to buy used as the price is usually negotiable. This can help to reduce those monthly payments, especially if you’re on a tight budget. While the process for getting a used car loan is pretty similar to a new car loan, the biggest difference is risk factor. Earlier we mentioned that the interest rate will be higher, but the loan term length can also be much shorter. Thinking about and knowing how much you can afford is key before you start shopping for a car loan. Step 1 in the car loan process is reviewing your credit report to make sure it’s accurate. Using online tools such as Experian, you can get a free credit report to analyze and look for any inaccuracies. Should you come across any, report them asap. Reducing debt, timely payments, and using credit cards wisely can all impact your credit score and ability to get approval from a lender on a car loan. It’s easy to get sucked into going with the first lender to offer you a great car loan. It also might be more convenient for you to have the dealership do the research for you. There are two common mistakes as they often result in situations that aren’t ideal for you. Whether you’re buying a used car from an owner or through a dealership, we recommend that you run a history report. This will show any big crashes or maintenance repairs that you should be aware of before you purchase the vehicle. This can also help in price negotiation. All you need is the vehicle’s VIN number. Now that you know you can get a car loan for a used car, let’s talk about the pros and cons of buying used vs. buying new. Even though there might be more homework involved, buying a used car might be the best option for you. Not only will you have to pay less up front, but you won’t have to worry about the depreciation, the original owner will. New cars usually lose about 50% of their MSRP within the first three years. Insurance costs might be less. The older the car, the less value it has which means it won’t require as much insurance. If you do buy an older used car, it’s important to make sure your insurance covers any issues that could arise with older safety features. Buying a certified pre-owned car often requires a manufacturer to inspect it and become responsible for some repairs, which will save you money down the road. You’ll be able to afford that 1970’s mustang convertible you’ve been eyeing for years! You’ll be limited in color, style, options, and add-ons. The only cars available are what’s on the market. You, unfortunately, can’t be too picky. Typically, used cars don’t come with a warranty. While there might be the option to get an extended warranty, we recommend that you get any used car thoroughly inspected by a mechanic before buying. Even the prettiest of cars could have a huge underlying problem that could be costly. The extra expense of inspection and warranty will save you time, money, and stress. Similarly, you might have to splurge sooner rather than later on a new radiator, transmission flushes, brakes, or tires – if you get a lemon, you might be faced with all four! We mentioned this above, but your car loan will have a much higher interest rate, which you’ll have to plan for financially and mentally. When Should You Buy Used? Typically those who can’t afford a big down payment or those with little to no credit buy used cars, mainly because financially this option is the one that is most affordable. Even those new or younger drivers often buy used cars due to the lower price. Nothing beats the feeling of driving off the dealer lot in a shiny, brand new car, but is that the right choice for you? The low interest rate of a new car means that you won’t acquire a ton of interest and pay an arm and a leg for a vehicle. Plus, this low interest rate might mean that you can afford a car with all the bells and whistles. You’ll also receive the latest technology and safety features. You won’t know the true value of that back-up camera until you have a car with that feature (trust us on this one!). Newer cars require an oil change every 10,000 miles which can help you save some money, since older cars usually require oil every 3,000-5,000 miles. The option of a manufacturer’s warranty, leasing, and special finance offers can provide the peace of mind you’re looking for when getting behind the wheel of a new car. You might also get complimentary roadside assistance bundled into your rate. You never know when you could get stranded and oftentimes those towing trucks aren’t cheap. The return on investment might not be worth it to you. With an 11% loss of value as soon as you drive it off the lot (according to Edmunds) coupled with the depreciation you’ll see in the first year, this is one investment where you will see very little profit. Insurance premiums will be very high. Usually dealerships and financial institutions will require full insurance protection until it’s paid off, which could be years and years away. The new car smell wears off pretty quickly. Paint can start to chip and those floor mats will get dirty pretty fast, meaning you might need to look into a cleaning service which adds more money to your monthly car budget. Is the high monthly payment worth that? Buying new also means that you’re incurring a lot of debt, and that may not be the best solution for you financially or mentally, especially if you already have little to no credit. When Should You Buy New? Besides a house, buying a car is usually the second biggest purchase a person will make in their lifetime. If you’re spending your hard earned money on a big purchase, buying new seems to make the most sense as the reliability and safety will be top notch. Plus, new cars can now earn over 200,000 miles and still be fine to drive. Typically those who have good credit and are financially stable tend to buy new cars over used cars. Co-signers can also help those with a lower credit score in being able to afford new cars. Our main goal at LendingArch is to empower you while helping you to get the best car loan possible. We do this by matching you to lenders with a 98% loan approval rate – no matter if you have no credit, bad credit, or have previously filed for bankruptcy. We welcome all applicants. Are you ready? Compare and find your best car loan with LendingArch today.